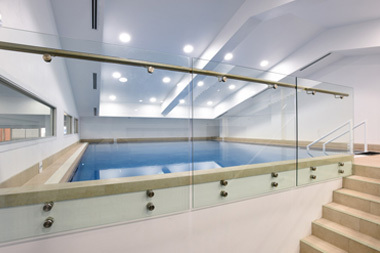 Are you planning a pool party at your house and do you want something really special? 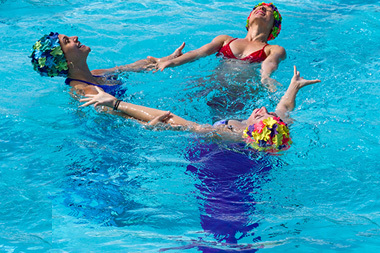 Imagine three beautiful mermaids performing at your child's birthday party! Swimming, diving, moving in patterns. Splashes of colour in the sparkling water. Our synchronised mermaid show and ocean inspired - music will transport everyone at the party to the magical world of mermaids and mermen in Australia's one-of-a-kind performance. 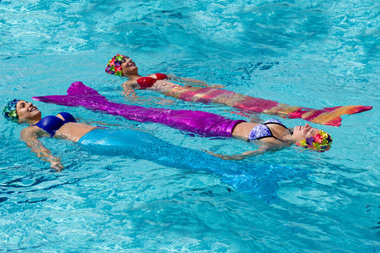 After the performance, the kids who are confident swimmers will be invited to use their own mermaid fins, or borrow some from us, to join our mermaids in the pool. There will be plenty of photo opportunities above and under water so that the excitement and memories are captured for years to come. Pre-party meeting to discuss the details of the party - custom arrangements etc. 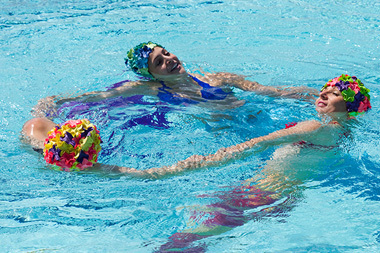 Our mermaids are competitive Synchronised Swimming athletes and Instructors on an international level, some even performed at World Championships! Ask us about an Evening Mermaid Performance as a special night time event where water, lights, music and colour blend together in a perfect harmony. Struggling to decide what entertainment to book for your child’s next birthday party? 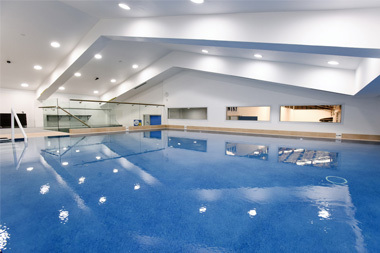 Keep them active and happy with 2 hours of pure Mermaid Fun at the newly built, state of the art private pool facility! 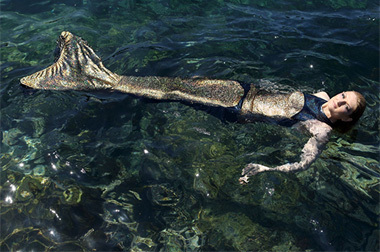 The party starts with a Mermaid performing twists and turns in the water. 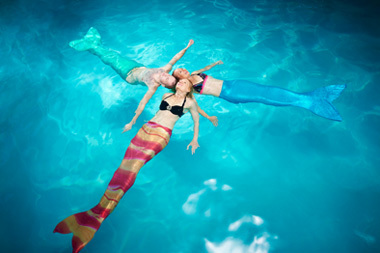 A few Mermaiding tips and then let the kids experience the amazing feeling of swimming with a mermaid fin! If the kids are under 7, close parent supervision in the water will be required. Kids under 7 can not wear mermaid fins for safety reasons. 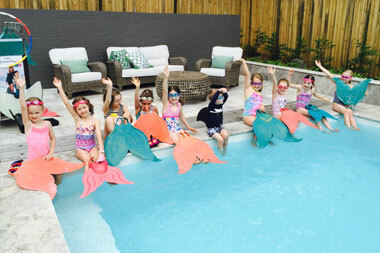 The ultimate two-hour mermaid party celebration in your own swimming pool for up to eight kids, for ages 7+. A combination of fun land and water activities, will keep the kids active, happy and entertained. We spend 1hour in the pool + we make ocean bracelets, apply ocean tattoos, put on mermaid sparkles and play games so the kids learn about endangered ocean species. 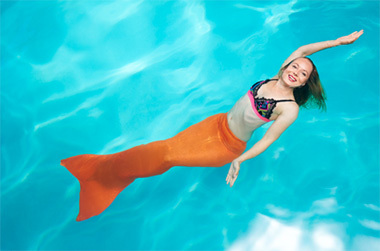 This fun party is most suited for mermaids and sharks who are confident swimmers and would like to find out what it’s like to swim with a mermaid fin. Let us know what your plans are so we can help you to make your celebration day fun, memorable and stress-free. “Charlotte had a wonderful 10th birthday party and loved being a mermaid. Her friends also loved the experience. It was great to see some of the girls pick up the mermaid swimming technique straight away with your guidance - some of them were naturals!"